Catalogue of exhibition of antiquities from Tell el-Amarna, 1921-22: exhibited at the Society of Antiquaries, Burlington House, July 3rd to July 12th, 1922 / Egypt Exploration Society. 1922. London : Egypt Exploration Society. Catalogue of the Egypt Exploration Society's exhibition of the results of the recent work at Abydos, Amarna & Armant: Wellcome Historical Medical Museum, 17th June to 27th July, 1932. 1932. London: Egypt Exploration Society. Davies, N. de Garis 1903-1908. The rock tombs of el Amarna, 6 vols. 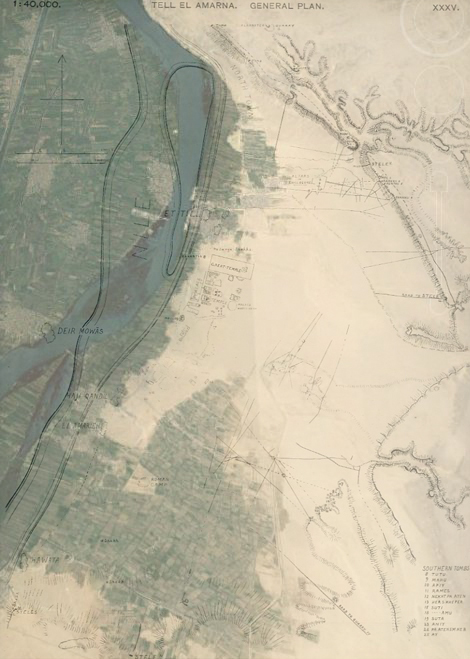 Archaeological survey of Egypt 13-18. London: Egypt Exploration Fund. Fairman, H. W. 1935. Topographical notes on the central city, Tell el-'Amarnah. Journal of Egyptian Archaeology 21 (2), 136-139. Frankfort, H. (ed.) 1929. The mural painting of el-'Amarneh. Francis Giesler Newton memorial volume. London: Egypt Exploration Society. Kemp, Barry 2013. The city of Akhenaten and Nefertiti: Amarna and its people. London: Thames & Hudson. Newberry, Percy E. 1893. The archaeological survey of Egypt: Mr. Newberry's work, 1892-93. Archaeological Report 1892-1893, 9-15. Pendlebury, John Devitt Stringfellow 1935. Tell el-Amarna. London: Dickson & Thompson. Stevens, Anna 2012. Akhenaten's workers: the Amarna Stone Village Survey, 2005-2009. Volume I: The survey, excavations and architecture. Egypt Exploration Society, Excavation Memoir 100. London: Egypt Exploration Society.